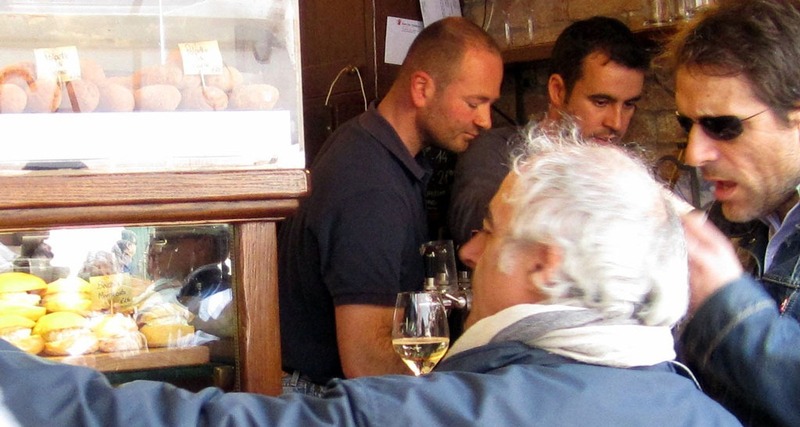 When it comes to wine and food, Italy has an abundance of special places, events and celebrations, and we’ll share some of our favorites with you in our “Local Scene” series. In today’s Wine Journal, Michael takes you to Venice to peruse some of the best seafood that Italy has to offer. 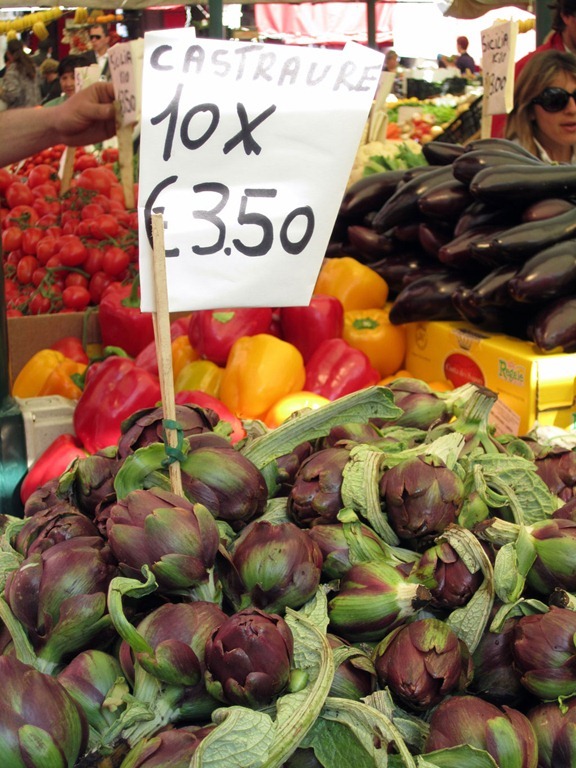 Nearly every town in Italy has its Market Day when regional and traveling vendors display their best and sell to the locals. 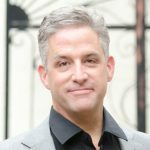 The origins date back to the time before the convenience of supermarkets and automobiles, when it was more profitable for vendors to travel to where the wealthy city dwellers lived. While today it’s easy to make the trip down to the nearby iperCoop supermarket, Italians still shop the stands, carts and trucks of the venditori on Market Day. 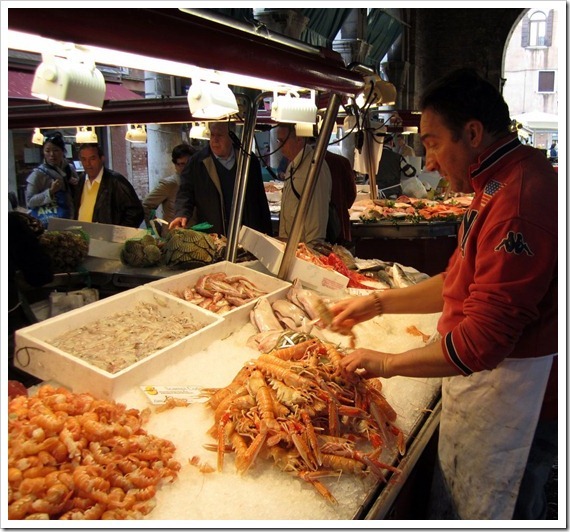 Enter the Rialto Fish Market in bella Venezia, where the local pescatori (fishermen) bring their finest fish to one of the largest and oldest fish markets in Italy. Open Tuesday through Saturday from 7:30AM till about 1PM (the pescatori take Sunday and Monday off), locals and ristoranti owners alike flock here daily to find what’s-in-season and what’s-for-dinner. The covered market opens in the wee early hours of the day, rain or shine, and the social scene is exciting to watch. 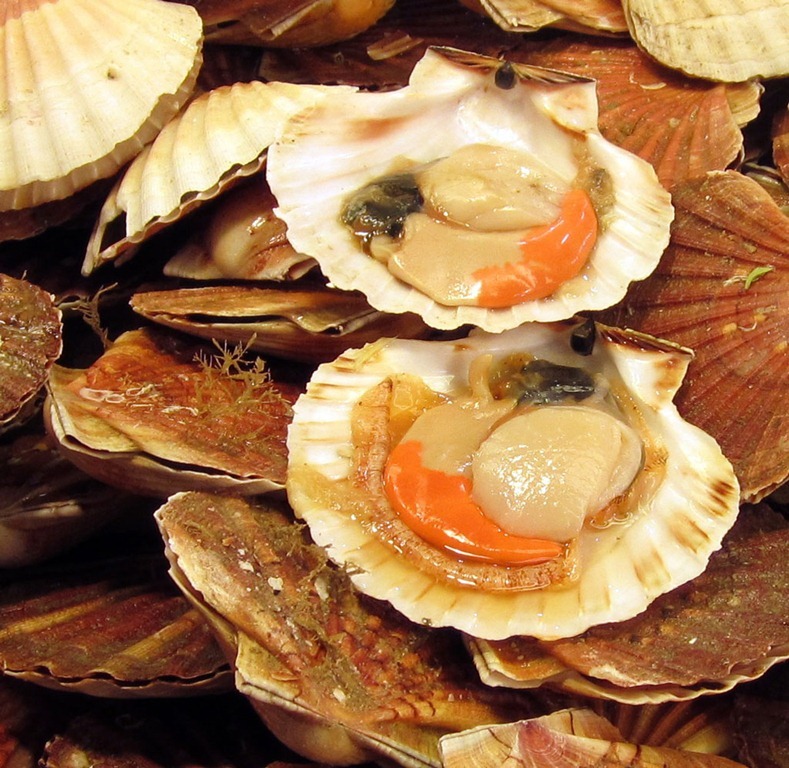 Rows of Venditori busily arrange and replenish their latest catch in a daily contest to see who has the most handsome selection, barking “Pesce fresco! 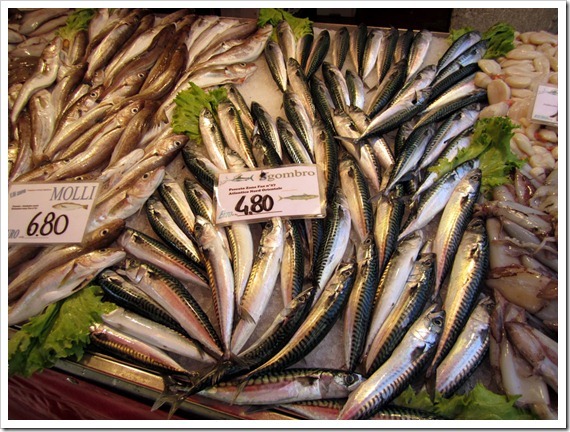 Pesce fresco!” (PAY-shay, “fresh fish!”) to get your attention. Venetians make it a point to catch up on the latest gossip with their neighbors over a cappuccino (or a glass of local vino) and cornetto (Italian croissant). Pigeons slink around gobbling up whatever fish parts hit the cobblestone. It’s a ritual you can’t miss on your next trip to Venezia. 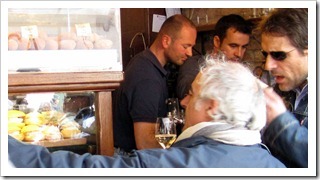 While on a wine-buying trip for new and interesting wines in the Veneto, I dropped into Venice to catch up with my buddy Roberto at Pensione Guerrato, and join the colorful parade of locals for a tour of this rightly famous Fish Market, located just a few short blocks west of the Rialto bridge in Campo Pescheria. Take a stroll with me through the mercato today, and let’s see what’s on the menu for tonight’s dinner. 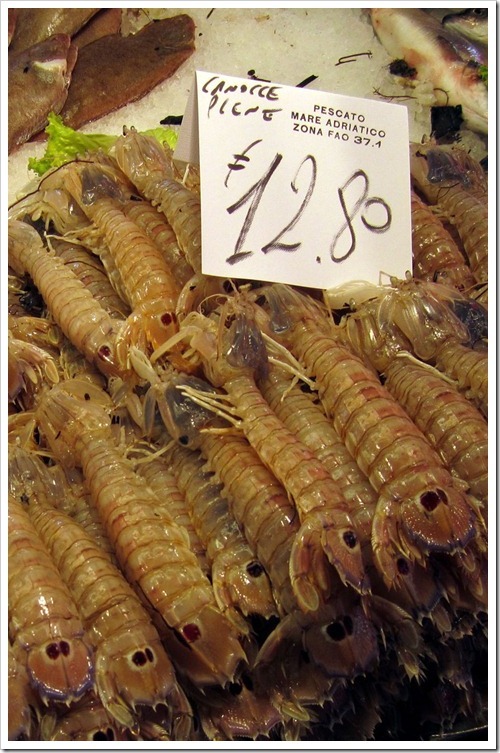 These babies are everywhere at the Rialto Fish Market. 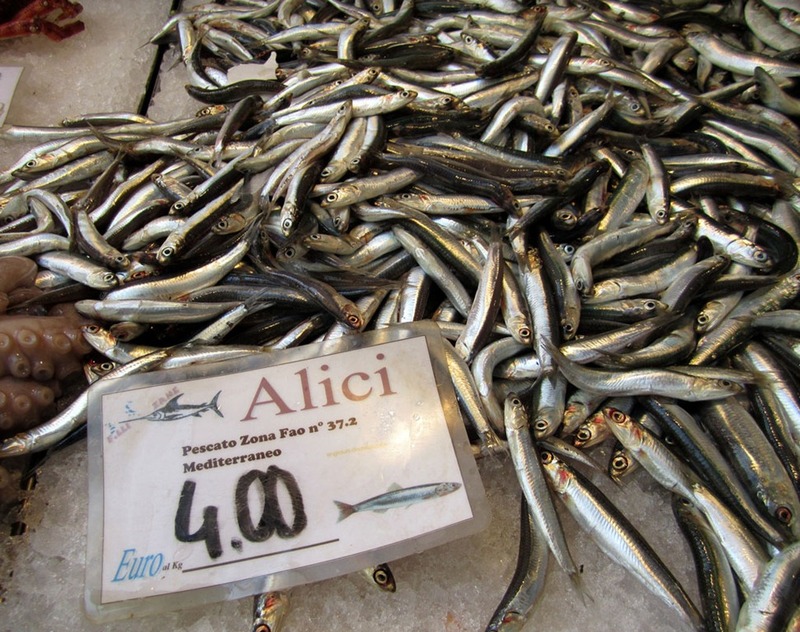 Young, succulent anchovies, called Alici (ah-LEE-chee) in Venice and Acciughe (ah-CHOO-gay) elsewhere, are a mainstay throughout the coastal regions of Italy. 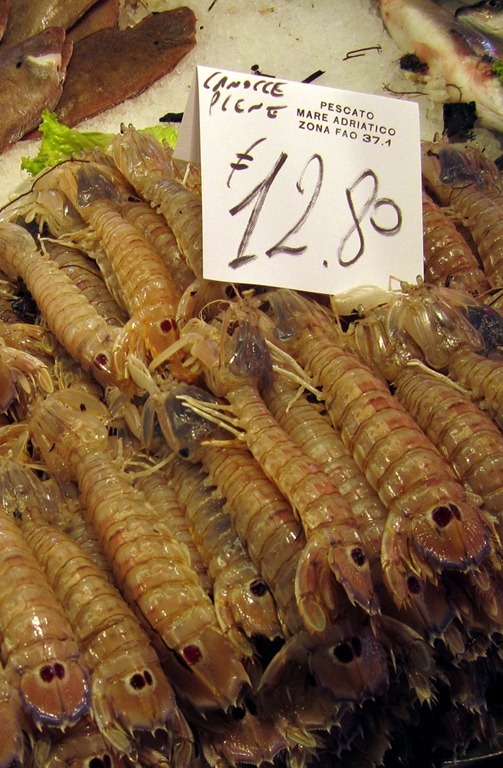 In Venice you’ll find them grilled; personally I like them flash fried in olive oil, like they make them in Genoa – fresh, crisply, salty little “fries with eyes” that you pop in your mouth, head and all. Sgombro are small mackerel that are the perfect size and ready to grill over hot coals. Local osterie serve these by the ton because they’re plentiful and cheap (here at about 3 bucks a pound), and they’re perfect food fare while in Venezia. 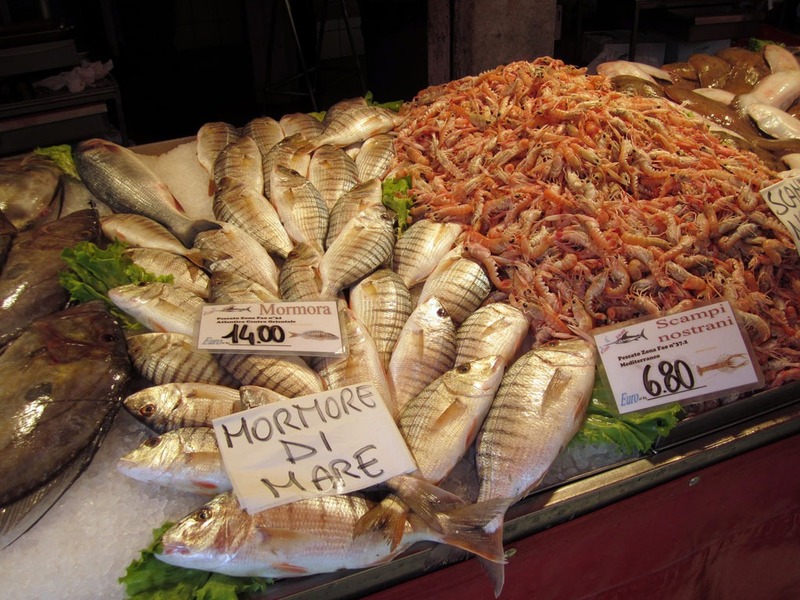 Considered the poor man’s Orata, the Mormora is a striped member of the Sea Bream family, a white fleshed fish found along the rocky coastline of the Veneto and Emilia-Romagna. 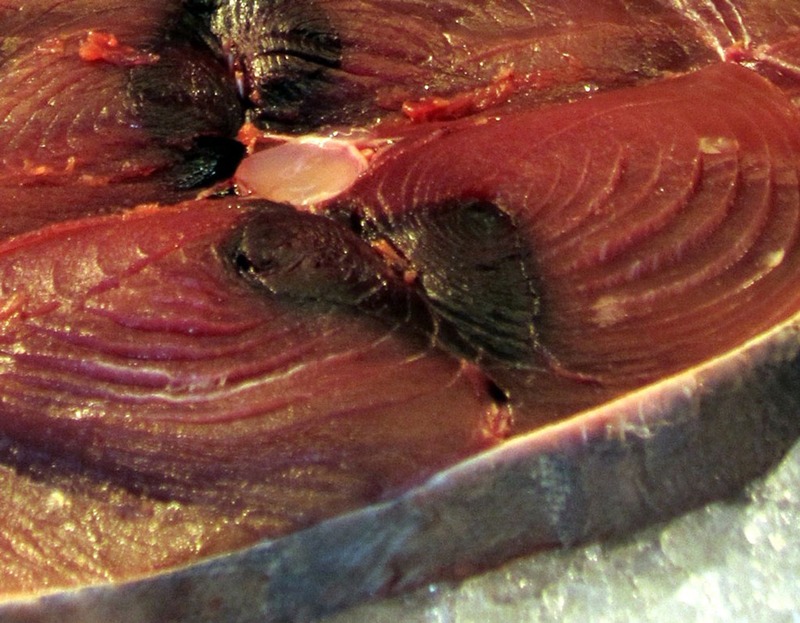 These 1- to 2-pound fish are perfect for roasting or grilling over coals. 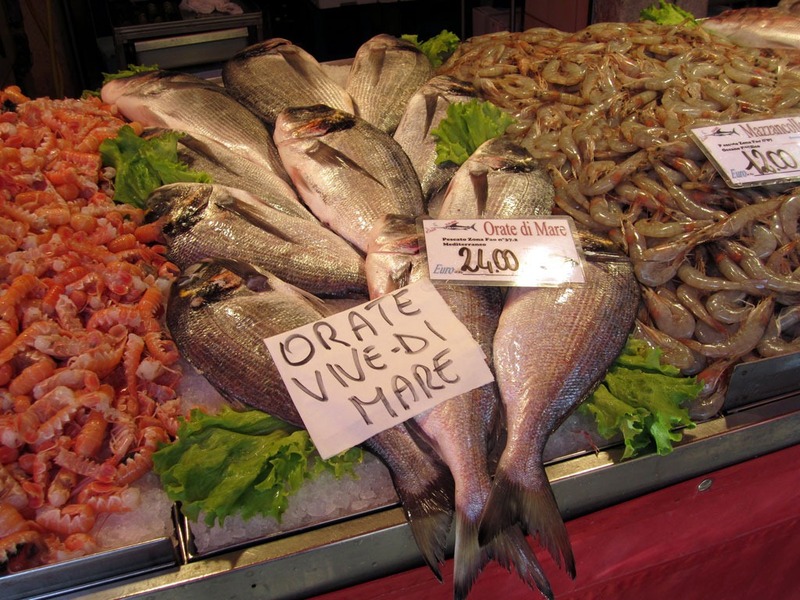 The Orata (also called Gilthead Porgy or Daurad here in the States) was sacred to Aphrodite in ancient times, and is today among the most sought-after variety of Sea Bream in Italian markets. 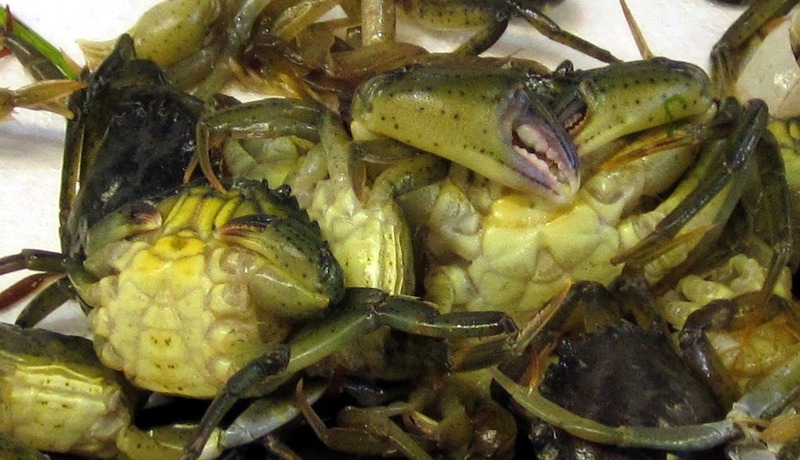 They’re fatter and meatier than the Mormora and the Porgy of the US east coast, with richer, more dense flesh. Venetian ristoranti grill, roast and steam their Orata whole, making a perfect meal for two – albeit a bit expensive here at $16/pound retail. 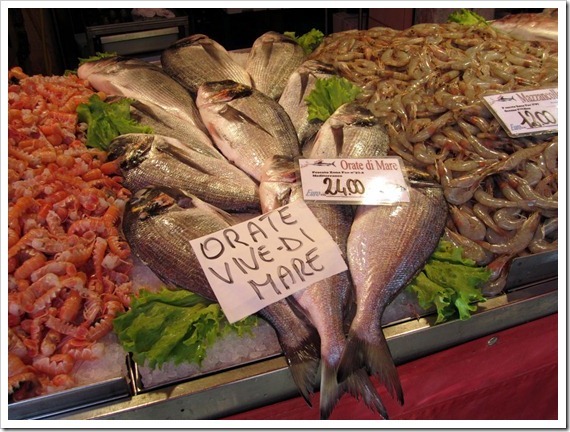 You’ll find the “Vive di Mare” sign proudly displayed on fish harvested from the open Mediterranean waters by Pescatori that want you to know it’s fresh and healthy, and not farmed unnaturally in a cage. 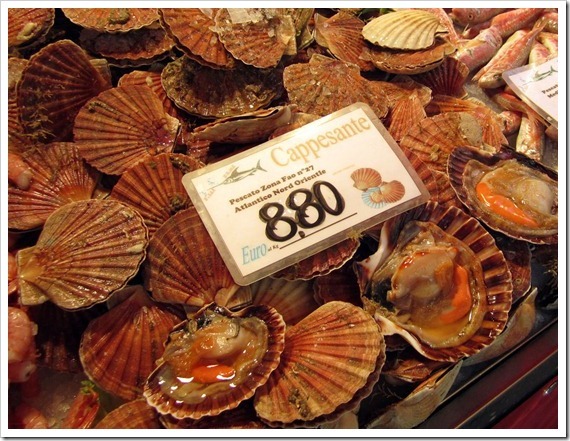 The scallops from the northern Adriatic sea are sweet and minerally, and they don’t come any fresher than this. 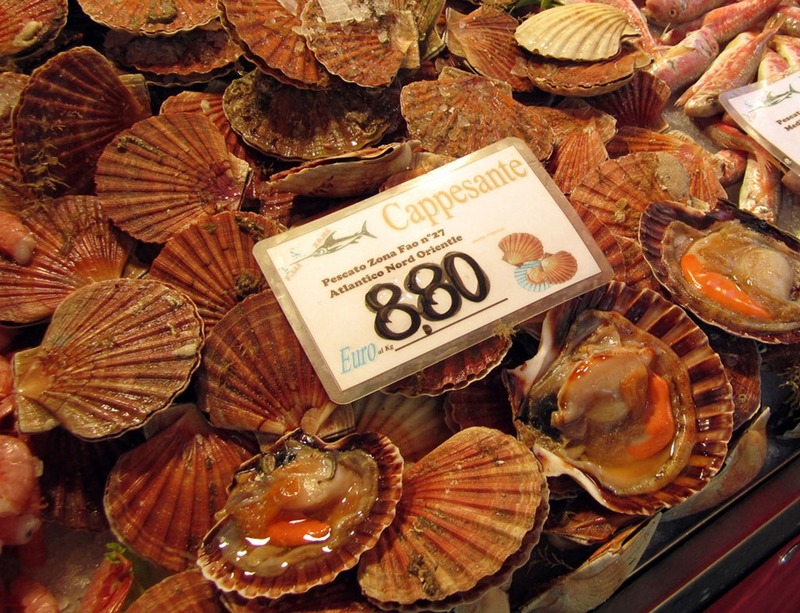 Ristoranti in Venice prep these sweet scallops by removing them from the shell, rolling the whole thing in bread crumb with a hint of minced garlic, and replace them in the shell with a dab of butter beneath them. 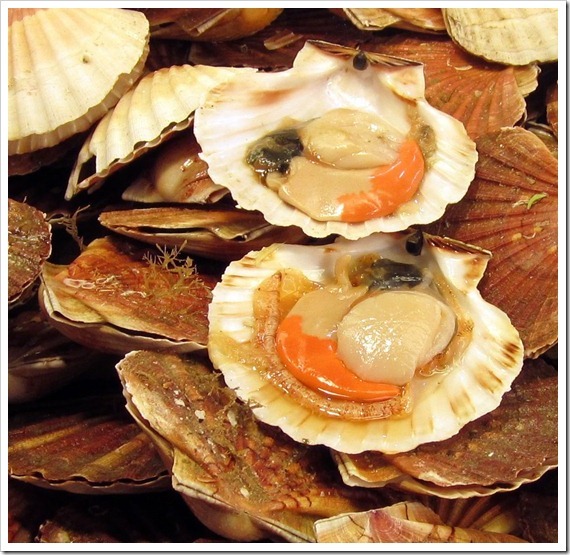 The cuoco places them under the broiler until the scallop meat just turns white, and not a moment longer – then serves them to you on the half-shell. Heavenly. The Fish Mongers at the Rialto Market really work their butts off. Imagine having this guy’s job, handling fish for 12+ hours a days, 5 days a week. This busy professional is up by 3 AM to load up his delivery boat with the latest catch, then spends another 10 hours cleaning, prepping, cutting and arranging all manner of fish, crustaceans and mollusks. And tomorrow he gets up and does it all over again. 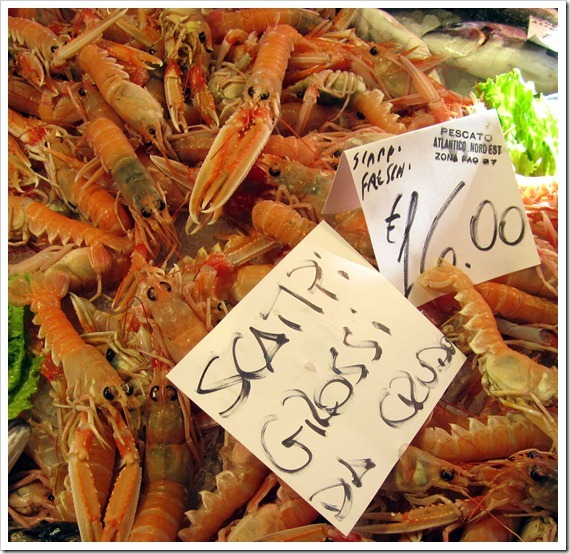 Not to be confused with gamberi (“big” shrimp), these scampi look and taste a lot more like lobster meat. 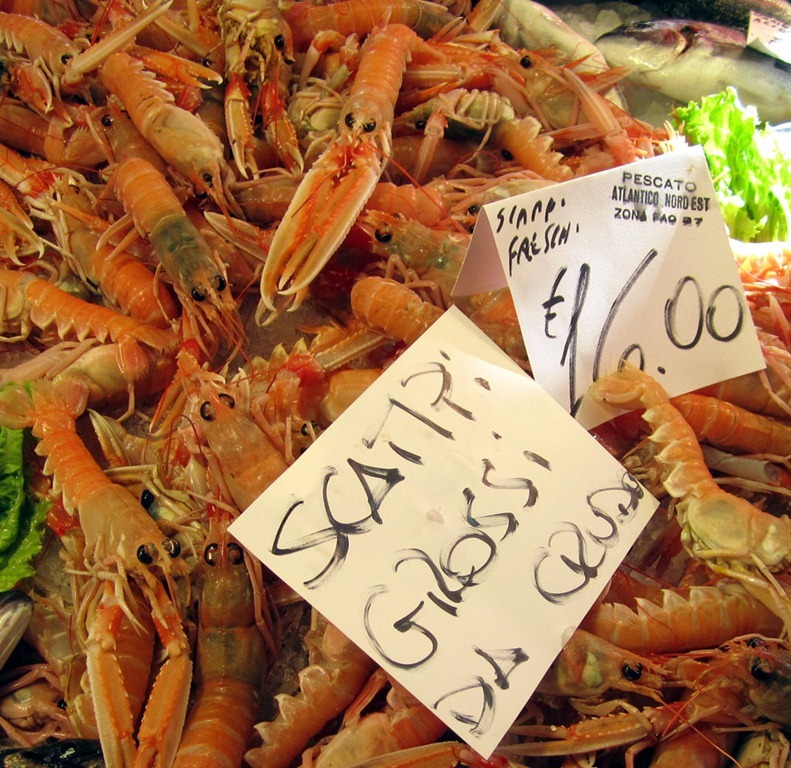 There’s not much there, but you’ll swoon over a fresh plate of steamed scampi at a local Venetian osteria. OK, these buggers look like something out of prehistoric times. 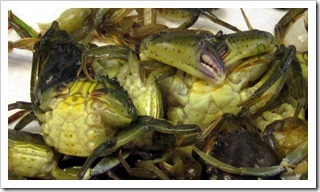 A fellow travel buddy of mine always says, “the uglier the fish, the better it tastes.” That must go for crustaceans as well. These centipede-looking “shrimp” are the sweetest, most succulent I have ever tasted. Local trattorie serve them by the plateful. I love tuna. The only problem is that it’s endangered in many fish runs, and the Mediterranean blue fin is one of them. 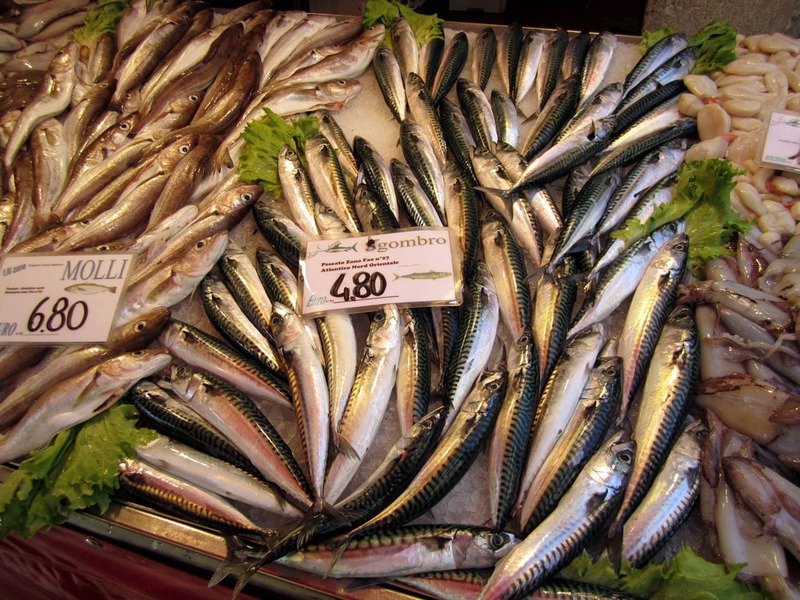 This fish is intensely flavorful, and a favorite throughout Italy. 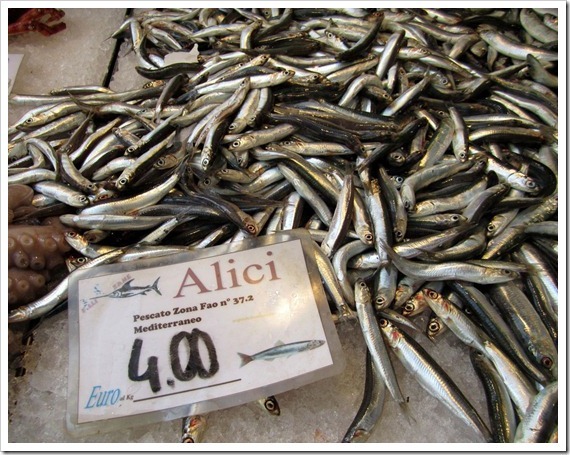 The scarcity is reflected in the price, here at $15/pound. Another Fish Monger busy tackling a tonno for the local patrons. 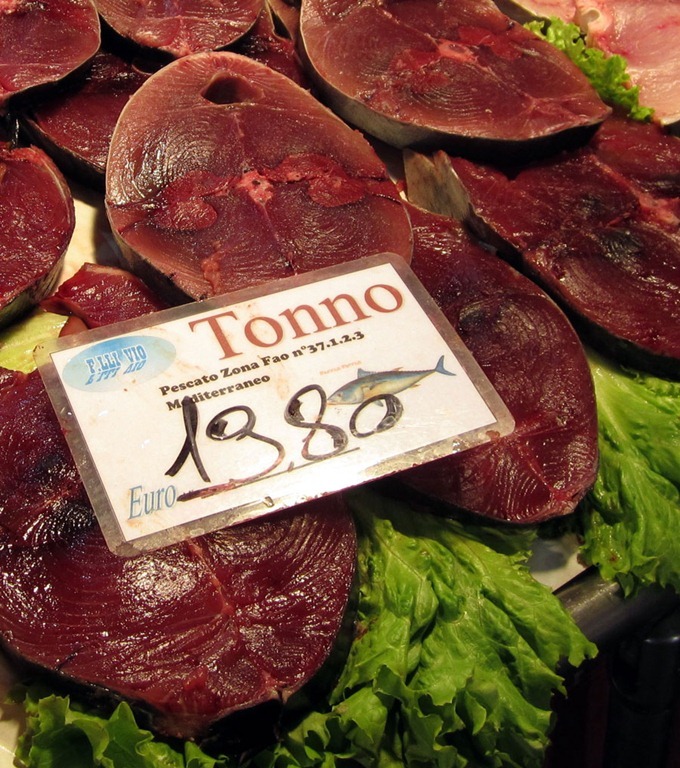 Fewer Italians are eating tuna these days because of concerns of fishery viability, but demand is still strong enough to bring these big fish to the markets. 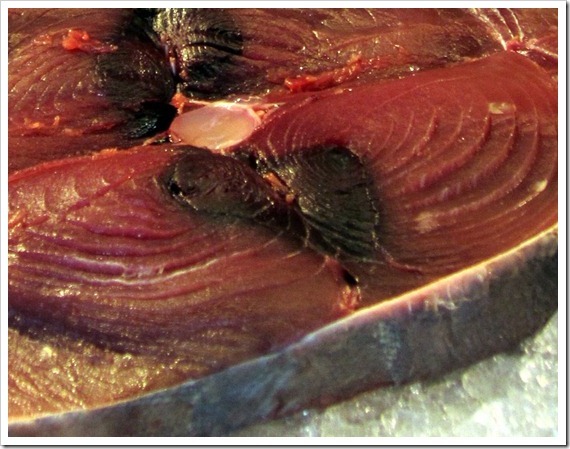 Tuna steaks – and now you know why people love this succulent fish. 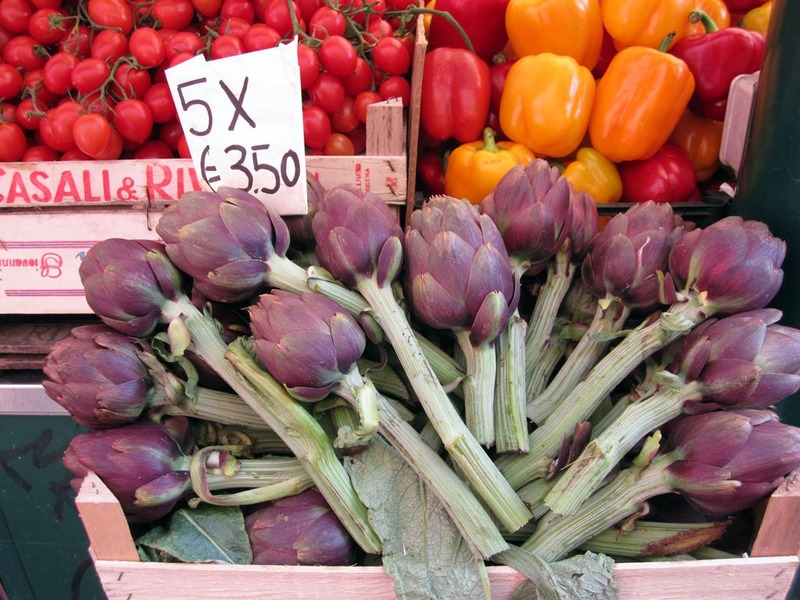 Not to be outdone, the fruttivendoli (fruit and veggie vendors) setup shop at the adjacent Rialto vegetable market, with mountains of tantalizing vegetables from the nearby island of Sant’Erasmo and elsewhere in the Veneto region. The famous Violetta Carciofi, costing a buck a piece, arranged artfully and ready to be trimmed, steamed and eaten by hand. 14. Castraure (baby Artichokes) to die for. The best of the best, baby artichokes are called “castraure” (pronounced cass-trah-OO-ray, and literally translate as “castrated”) and are the most tender. They’re the side shoots of the plant, nipped young and before the fuzzy choke has developed. You boil/braise/steam these babies, drizzle a little olive oil or butter on them, and pop the whole thing in your mouth. 15. So many kinds of Radicchio. 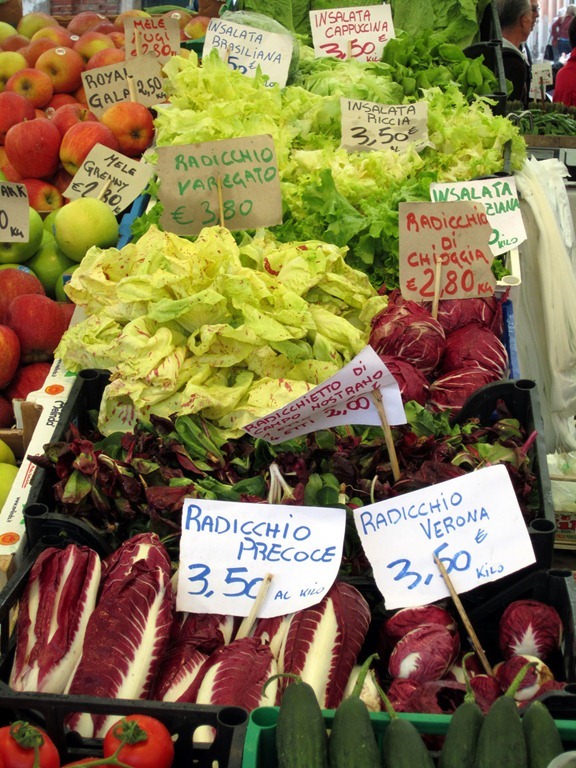 Italians love their radicchio, and they grow an immense variety. 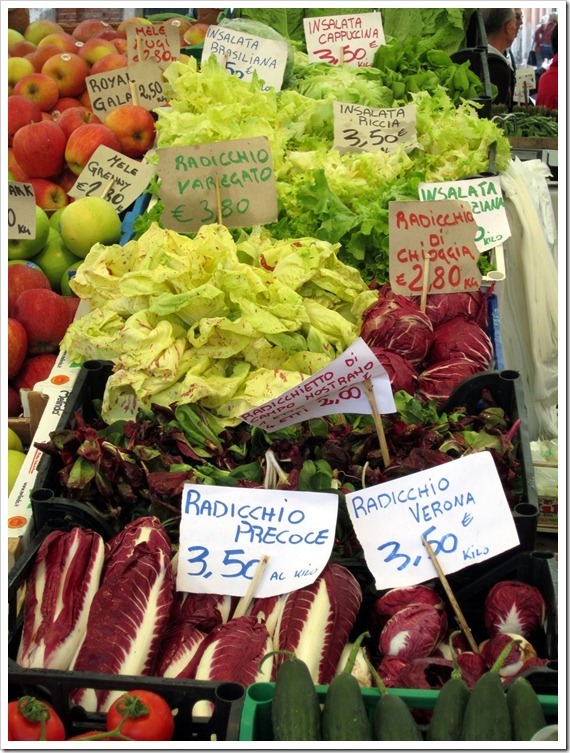 My favorite is the speckled Radicchio Castelfranco. Note the phrase “nostrano” used to denote truly local produce, grown by the fruttivendolo herself. 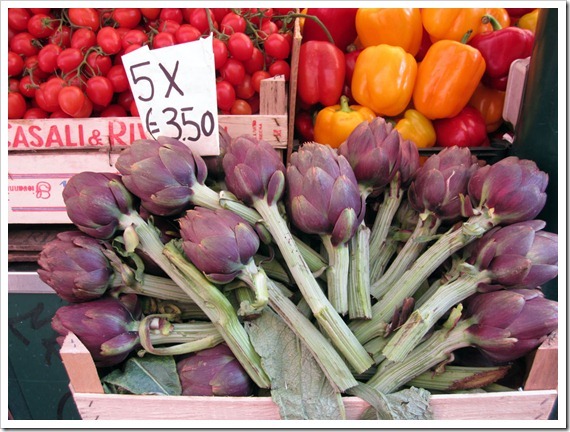 There is so much more to the Rialto fruit and vegetable market, which has it’s own seasons and rituals. You’ll have to experience it for yourself on your next visit – a must-do itinerary item while in Venezia. 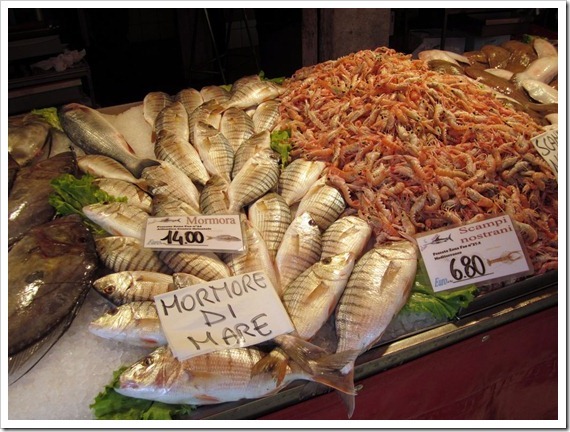 Have you visited other Fish and Vegetable Markets of note in Italy? What about in Roma, or Milano? 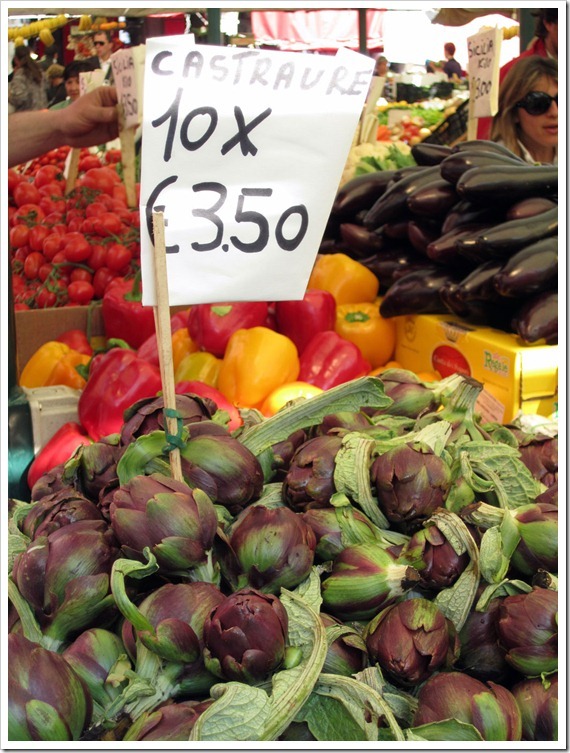 Have you visited the San Lorenzo all-year vegetable and meat market in Firenze? 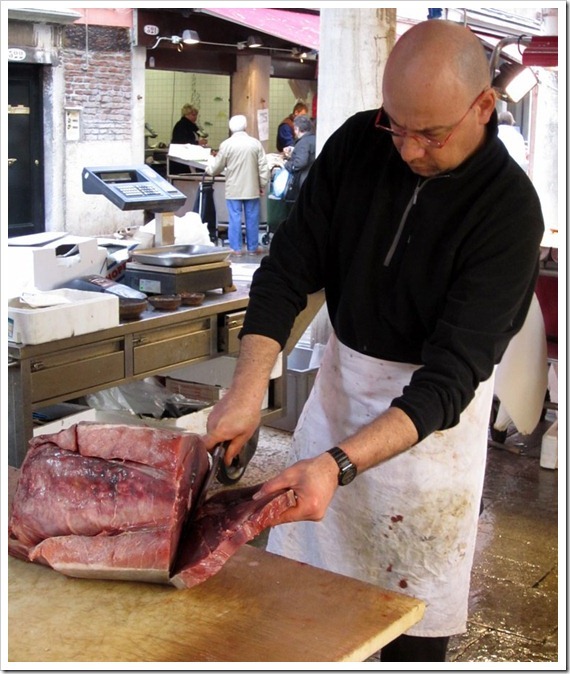 Share your experiences, let us know what really jazzed you up and maybe we can do a follow-up posting on your favorite Italian market. Add your thoughts and comments below. 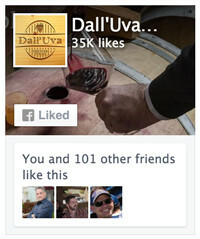 If you haven’t already, don’t forget to Subscribe to the Wine Journal so you get notified of our regular updates on Italian wine, food and culture. Hi Michael, just had my first trip to the Rialto market and made off with the best looking (and smelling) fish and veggies ever. My only regret is not knowing any Italian to ask whether I could eat any of the seafood raw because the quality looked amazing! Hi Christine! Yes, most of the seafood is sushi grade, so if you know how to cut, I’d say go for it. 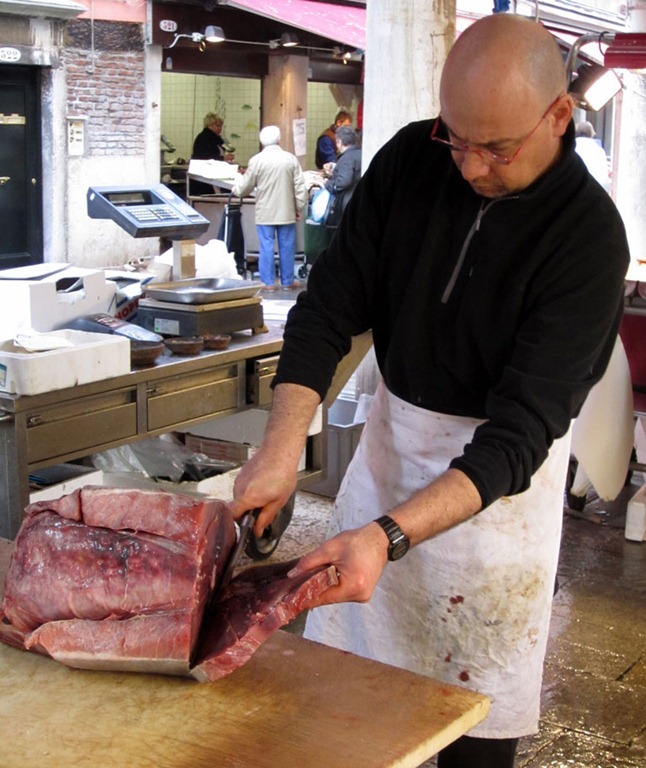 The Italians have the equivalent of sushi, called ‘crudo’ (literally, “raw”), and I’ve visited several places along the Adriatic that serve it.